Why would a Hungarian man run down a Manhattan street ranting "I'm king of the Puerto Ricans"? What made a physically healthy woman persuade surgeons to operate on her more than a dozen times? How could a man in a straitjacket commit suicide while in a strictly supervised, locked psychiatric ward? Though these and the other stories in this book read like fiction, each is true. Former practicing psychiatrist Mark Rubinstein takes readers deep into the world of mental illness. From the chaos of a psychiatric ER to the bowels of a maximum security prison, the stories range from bizarre to poignant and the people from noble to callous. 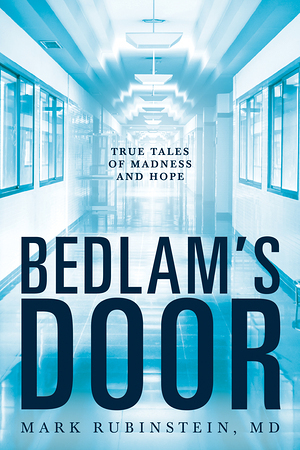 Bedlam's Door depicts the challenges mental illness poses for patients, families, and health-care professionals and offers hope for the future. Like the case histories in The Man Who Mistook His Wife for a Hat by Oliver Sacks, it shows that though every person's story is unique, we are all more alike than different and are linked by our shared human experience.